Some 200 experts in food engineering, food science and food technology participated at the 3rd IDF Symposium on Microstructures of Dairy Products in Montreal, Québec, Canada, from 3-6 June 2018. It was the first time the IDF had coorganised the Symposium with the 3rd Food Structure and Functionality Forum and Elsevier, offering a platform for academia and industry to meet and engage with young scientists. The latest research in the structuring and destructuring of food and dairy products which are useful in the development of innovative products to cater to growing consumer demands were discussed. Their applications, ranging from improved health and digestion (nutritional release in the gastrointestinal tract) to new texture development and extension of shelf life was a topic which attracted great interest. “Collaboration with the Forum facilitated the cross fertilization of ideas involving food microstructures and dairy science, which is very useful in understanding their complementary roles in industry applications,” said Laurence Rycken, IDF Technical Manager. The three keynote speakers for the dairy session included Professor Jason Stokes of the University of Queensland, Australia, who spoke on the topic ‘Towards Rational Food Structure Design’ where innovative (in vitro) multistate measurement techniques are developed uncovering the relationships between structure and dynamics at different lengths and time scale spanning the fields of theology, tribology and bio interfaces. This measurement will assist in predicting and designing product performance, as well as unravel the physical basis for many sensations which will assist food manufacturers to innovate. 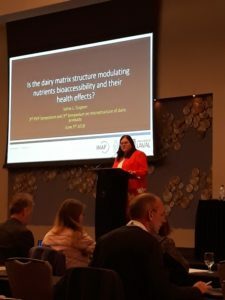 Professor Sylvie Turgeon of the Université Laval, Canada, presented the topic ‘Is the Dairy Matrix Structure Modulating Nutrients’ Bioaccessibility and their Health Effects?’ She discussed two different studies on how the dairy matrix releases nutrients and its impact on health. One study looked at the impact of yoghurt with a modulate casein-to-whey ratio and its impact on satiety. The second study was aimed at determining the effect of cheese attributes on lipid release and absorption. These studies demonstrate that the dairy food matrix modulates nutritional properties. Dr Elisabeth Guichard of the French National Institute for Agricultural Research (INRA) focused on ‘Food Composition and Structure: In-mouth breakdown, oral physiology and sensory perception: example of dairy products’. She explained that food transformation which occurs in the mouth constitutes the preliminary steps in a series of reactions leading to digestion. She stated that dairy products offer great variability in composition and structure, and consumer tastes are dependent on different sensory descriptors involving texture, taste and aroma perception. Thus a modification of their composition and process will impact on their sensory properties.